The Drum Corps International Hall of Fame is where the legends of drum corps are remembered for the indelible impressions they have left on the marching music activity. The Hall of Fame began in 1985, with six inductees enshrined that inaugural year. Every year new members are added to this prestigious institution. To date, 127 people have been inducted into the Hall of Fame. New Hall of Fame members are elected in the spring of each year. 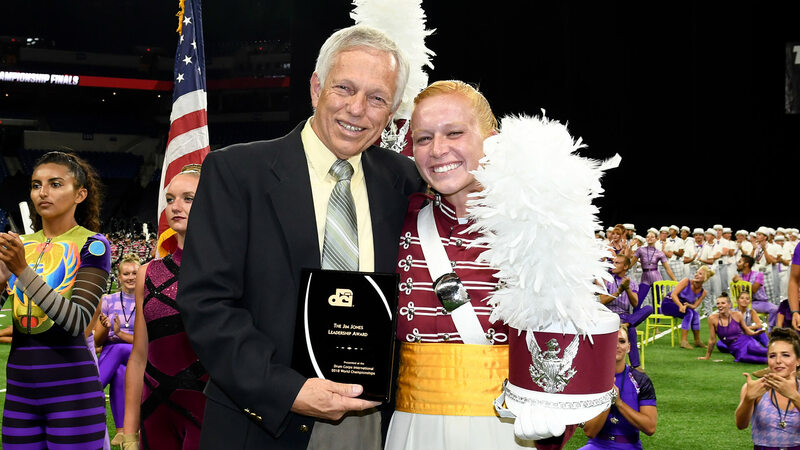 2018 recipient Claire Albrecht of The Cadets with DCI Hall of Fame member Gene Monterastelli. This award is given each year to one Open Class and one World Class drum major. It is named after Jim Jones one of the founding directors of Drum Corps International and a charter member of the Hall of Fame. Selections are made each year by a committee of Hall of Fame members. The funds for the award are also provided by members of the Hall of Fame. Currently there are 126 DCI Hall of Fame members.